Features: With textured wheels, an easy grip handle, and a durable design, the sturdy walker gives all the support they need to take their first steps. The fun-filled activity panel can also be removed from the walker for extra sit-down play. With lots of exciting activities, cheerful music, and friendly phrases, little ones will be introduced to numbers, shapes, animals, and colours. 2 In 1 Multi Functional Baby Musical Play & Push Walker AGE: 9 Months Function 1 Play Station: Sit on the floor and play Function 2: Push Walker Specifications: . Easy to install ,stable,Steel is slip-proof With textured wheels, an easy grip handle, and a durable design, the sturdy walker gives all the support they need to take their first steps. The fun-filled activity panel can also be removed from the walker for extra sit-down play Features: . With lots of exciting activities, cheerful music, and friendly phrases, little ones will be introduced to numbers, shapes, animals, and colours. 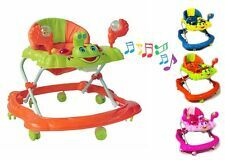 2 In 1 Multi Functional Baby Musical Play & Push Walker AGE: 9 Months . Easy folding, folds flat. Colour: Green/Blue, Blue/White, Pink, Blue/Yellow. 360 Degree Rotating plastic wheels. Lightweight & easy to move around. Detachable Music Panel. Toy Tray Requires 2 AAA Batteries (not included). BEST PRICE/TOP QUALITY/UK STOCK/FAST & FREE DELIVERY !! 2 in 1 walker and ride on toy, converts between walker and ride on toy. All in working order but will need batteries (2 AAA). Was gifted new to us two years ago and kept indoors so in very good condition. Get your kids moving with this ZUM Bugz Ride-on. Designed to look like an oversized Ride-on it features a smiling face and vibrant colors that kids are sure to love. Plus, with 5 multi-directional caster wheels it zooms around with ease for hours of healthy, active fun. The Bruin Play and Ride Walker is multi-functional, changing easily from a walker to a ‘ride on’. It’s easy to assemble and removing the legs from the walker and tightening them into place for the ‘ride on’ requires no tools (or screws) at all. Item Number: E0378. Stow your favorite toys in the bug's belly and take them along on your trip. Hape Ladybug features;. Hold onto the bug's antennae as you push yourself about. Weight limit: 50 KG. This is one of the most popular 1-3 year babies toys around the world! Baby balance bike. this bike will help your baby to practice balance and let him or her learn to walk fast! Best toys for child learn how to walk. Chicco Charlie Sky Rider ride on aeroplane baby toddler trike walker toy 12-36m. Condition is Used. Collection in person only. Daba: Walker. Iepakojuma saturs: 1 x Walker. 3 in 1 auto: Var ratiņi, staiguļi, izjādes auto. Augstas kvalitātes auto ar lielu ietilpību, izturīgs un ilgst gadiem. mēs neuzņemamies nekādu atbildību par mūsu produktu nepareizu iegādi. Ride motorcycle Neox Girl wide wheels carrying Injusa handle child juegete. Carrying handle and oversized wheels. Carrying handle, wheels of oversized for added stability. Wide wheels for greater stability. With a push beep! Horn and under seat storage, for all those favourite toys they can hide away. Push button horn with sound effects. My first push along ride on car, this little push along has a few neat features, that your child will love. With a push beep! Horn and under seat storage, for all those favourite toys they can hide away. My first push along ride on car, this little push along has a few neat features, that your child will love. Light and sounds effects and a shape sorter. Push powered ride on car and baby walker. 2 toys in 1. Car – Sit on the sturdy seat and use feet to push the car along and steer with the wheel. Tip - Suitable for indoor and outdoor use – do NOT use on wet surfaces or conditions . My first push along ride on car, this little push along has a few neat features, that your child will love, With a push beep! Very easy to assemble straight from the box. Specifications Suitable for Ages: 12 months Size: 48 x 20 x 40 approx. 2 TOYS IN 1. 1x Ride on Digger. Use the handles to move the manual arm up and down, to sop and move sand, dirt, water or even their little toys with the bucket and pick and grab with the claw. Baby Products. Push powered ride on car and baby walker. 2 toys in 1. Great toy or gift for the little one who always wants to be on the move. (Maximum weight: 30-35 Kg). A sturdy and stable design - Wide, hard wheels for safety and balance. Three products in one. great fun. learning to walk made easy. with ride on 1-2-3, your child can get going at just 6 months and start his or her first 'walking or driving lessons'. the 'cockpit' looks almost exactly like the inside of mom or dad's car.